What is the best cheap, compact, lightweight double stroller for newborn infants and toddlers? How can I pick the best double jogging stroller, side by side stroller, tandem stroller? With the variety of choices available on the market today, buying a double stroller could prove to be complicated and confusing for most parents. For the most families, strollers are like an investment. A double stroller is very useful for parents with children who are either twins or in close range of age such as a toddler and an infant. This ensures safety and comfort of the children outdoors, and the convenience for the parents who would not have to lug two kids at the same time while going about their errands. With that being said, there are many factors to consider when choosing a double stroller – the comfort for the children, ease of use, safety, as well as the convenience of using the stroller per se. This in-depth double stroller buying guide is meant to help you decide which stroller is the best for your family, what features to consider and to take note of. It also allows you to realize the things that you value in a stroller – the features that are paramount to you, and the features that you can go without. So here is our in-depth guide to buying a double stroller for your children. Double strollers are useful for families with young children who are both under four years of age. Regardless of the age gap of the children in the family, if two of them are under four years old, parents will get to benefit a lot from using a double stroller. Double strollers allow them to go on their errands and leisurely trips without having to physically carry two children at the same time, or carry one and hold the other one while walking. Double strollers also enable the parent to go around and walk leisurely in the park without worrying about chasing older and lulling a younger child. It also allows the children to rest or take naps even on trips outside the home and remain comfortable even while their parents can go about running errands or enjoying a morning or afternoon walk. Basically, double strollers will make a parent’s life easier. By far, the Contours Options Elite Tandem Stroller is the best double stroller if you have a toddler and an infant. Unlike other double strollers where one child may be less comfortable than the other, the contours options tandem stroller comes with seven settings that you could adjust to ensure that both your toddler and infant will be seated comfortably. 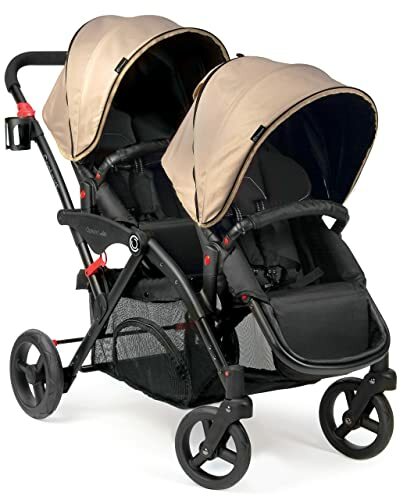 The seat backs are quite taller versus other tandem strollers, and the canopies are adjustable, and both provide full coverage, so you don’t have to worry about a sudden change in weather while you are out. The comfort level for the children is taken up a notch, thanks to the shock absorbers as well as the rubber-coated wheels of this stroller. All seats and harnesses have been padded; the footrest can be adjusted to accommodate your toddler’s longer legs, and the head rest is a lot cozier compared to other brands. 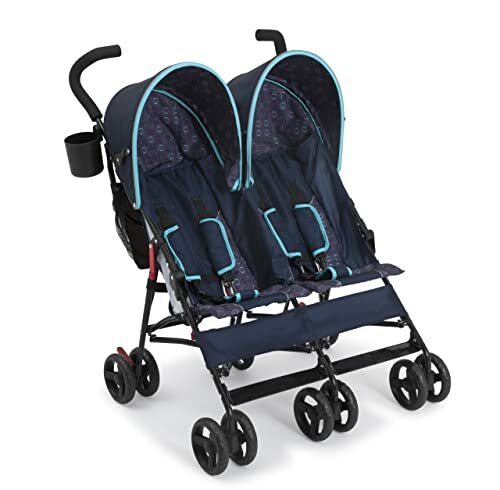 Moreover, this double stroller is very convenient to use, as it folds with both seats, and is compact enough to fit even in the trunk of a relatively small car. You may also note that the under seat basket has been made readily available for parents as there is a side zipper access for it. Double strollers for a newborn and a toddler can be very useful for families who want to continue their regular outdoor routine even with the birth of a new child. Having another child can drastically change a family’s lifestyle but with the help of equipment like double strollers, parents can perform their usual routine including normal errands without having to hire help, or wait for the other partner as one parent can be capable of lugging around two children out of the home. Newborns and toddlers have different schedules and habits, and getting a double stroller can be very helpful in terms of being able to respond to both of their needs even out of the home. For instance, the newborn can continue to nap while the toddler enjoys the trip out of the house by being able to look around comfortably through his stroller seat. When he gets tired, he can sleep in his seat individually reclined while the newborn remains comfortable looking around from her own vantage point. 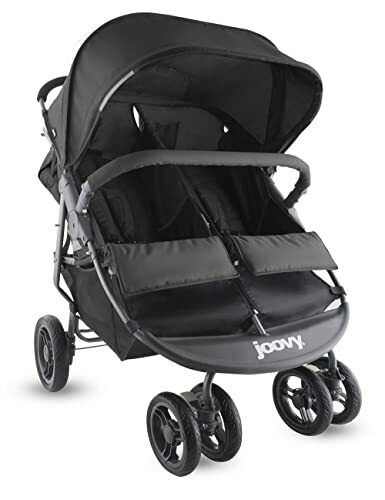 If you are in search for a double stroller that combines style, convenience, and comfort for your newborn and toddler, then the Joovy Scooter X2 is the best choice for you. The seats can be reclined independently from each other from many recline levels to nearly flat position for your newborn, and for your toddler who may want to nap. The canopies, as well as the foot rests, also adjust independently from each other, and the front bumper guards are removable. There is no sweat strolling around with the Joovy Scooter X2 because it fits standard doorways. The stroller is easy to maneuver too because its wheels have sealed bearings, and the bigger rear wheels make it easier for you to push the combined weight of your kids so easily. 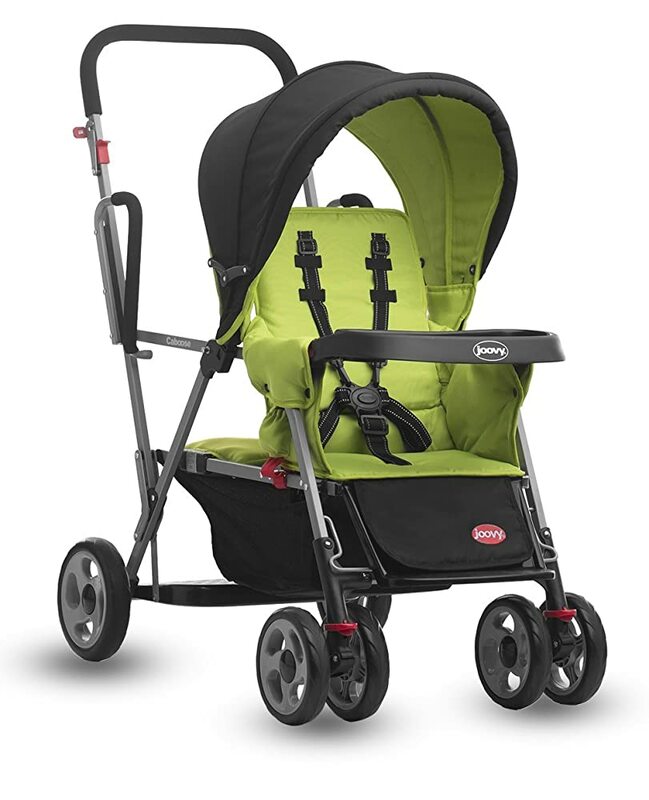 The five-point harness and easy to engage breaks also boost the safety features of this stroller! As for convenience factors, its manufacturers take pride in the fact that it has the biggest under seat storage basket on the market today. Apart from that, it comes with two parent cup holders, as well as back seat pockets that can be zipped up making it ideal for wallets, keys, and mobile devices. It has a one-hand folding system which takes seconds to operate, making it easier for you to stow it away in the trunk of your car or your home storage. You can never go wrong with this stroller. This type of stroller is useful for families who have babies who are close in age gap, or for twins. If your family is blessed with twins or children in close age range, then the side-by-side strollers are the best type for you. It gives both babies the same vantage point and provides enough front space for stretching out their legs. When they become older, it also allows them to easily get in and out of the stroller during trips to the neighborhood playground, and theme or amusement parks. It is also somewhat convenient for parents as they can approach both babies freely especially when it comes to changing diapers while lying in the stroller. It is also very likely that there will be fewer fights about who will stay in the back seat and who will be taking the front seat, as the seats are positioned side-by-side. You could never ask for more with the Britax B-Agile Double Stroller because it is simply the best lightweight double stroller there is. Imagine the comfort of infinite recline for your babies, with padded seats, and comfortably cushioned head? The extra shock-absorbing powers of its great suspension system offer the best ride for your children. The canopies are also extra wide and have a mesh ventilation system to ensure your little ones can breathe fresh air even when their seats are fully covered. It is very convenient for the parents as well! The stroller comes with Britax’s signature click and go feature which means it can accommodate your babies’ car seats on the go. It folds in place quickly and compactly. Also, it is so compact it can fit through doorways easily, and the handlebars are adjustable to your height and easy to maneuver at the same time. The stroller has great storage provisions too, like a big under seat basket that can be accessed even from the front, as well as back seat pockets that you can use for your essentials. The safety mechanisms are unparalleled too, with the five-point padded harnesses, and one step braking system, which is not hard to engage. Truly, this is the best double stroller in its class! B00K0AV47S: B00K0AV47S is not a valid value for ItemId. Please change this value and retry your request. Lightweight Double Strollers are very useful for families living in the urban and highly populated environment. 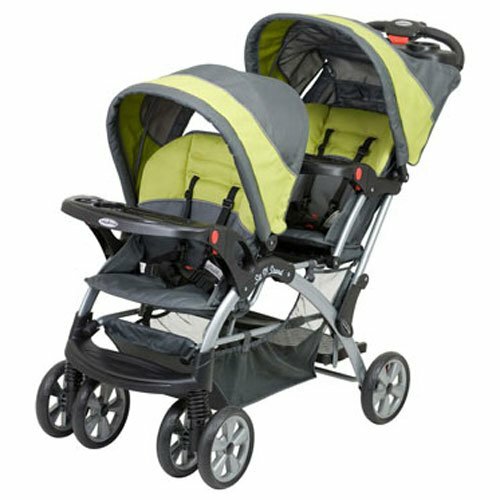 Lightweight double strollers allow parents to move around easily and maneuver roads and pedestrian walks while lugging around two young ones. Having a lightweight double stroller is also very helpful for families who take public transportation as it is easier to lug around, fold up, and then set up once again. And since this type of double stroller is lightweight it is easier to push around. It is also best for families with one parent who may have trouble carrying heavier objects, as lightweight double strollers are, as its name suggests, a lot easier and lighter to carry in and out of the car trunk. Since lightweight double strollers tend to be more compact, it is easier to fit onto doorways and elevators, as well as to maneuver even in crowded roads and indoor public places. What could be lighter than a 16-lbs double umbrella stroller? 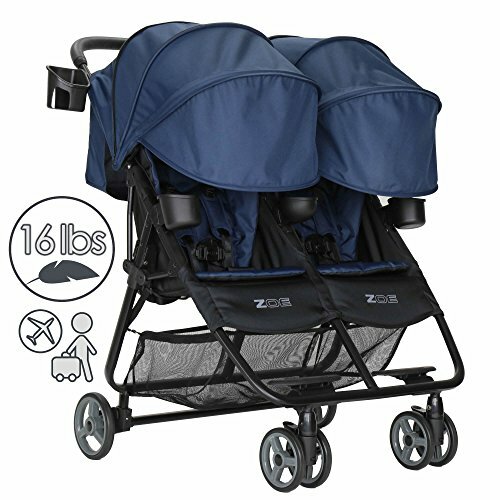 The Zoe XL2 Best Xtra Lightweight Double Stroller is definitely the best choice for families who frequently travel or reside in urban areas where strollers may need to be carried in mass transportation, or climb some type of stairway. It is super light, quick to set-up and fold since you can do it with just one hand and in one step! It is definitely perfect for public transportation. It can be easily maneuvered too, even in doorways or indoor commercial establishments. What is also great about this stroller is that it comes with cup holders for both children and parents. A snack holder for the kids, a back pocket for essentials like a mobile phone or keys, and of course a super accessible under seat basket for the equipment. Both seats recline independently from each other, and both come with huge canopies! The seats also have five-point harnesses and are adequately padded for baby’s comfort. 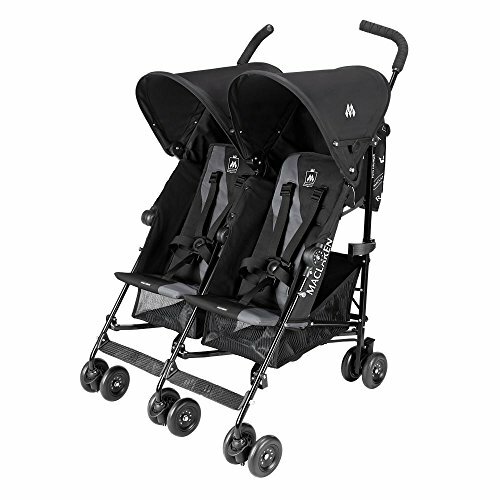 Truly the best lightweight double stroller on the market today! You cannot ask for more! 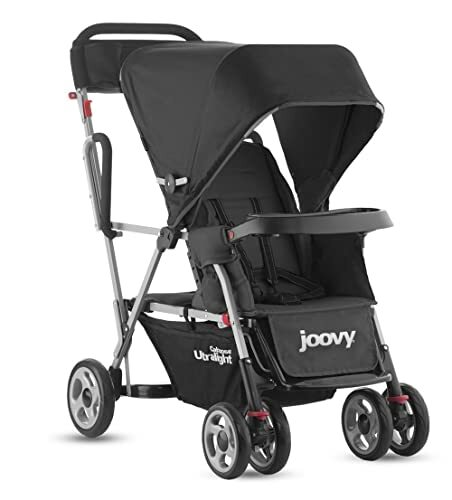 The Joovy Caboose Ultralight Stroller is one of the lightest double strollers on the market, and among the easiest to maneuver ever. This is a no-sweat double stroller because you can even push and move it with one hand. It is that easy to use! It also helps your older child to become more independent because of its comfy and safe sit and a stand feature. It has a universal infant car seat connector so you will not have to worry about buying a travel system and you can use your existing car seat anytime. Moreover, the stroller has great suspension system since all four wheels come with a shock-absorbing feature. You will have no worries about your children’s safety because the brakes are easy-to-operate, and at the same time, you have an added security feature that keeps the stroller in place when it is parked. It is super compact and light when folded so you will not have trouble carrying it to your car or your home storage. And speaking of storage, it has a wide basket that can be easily accessed. Truly the best double light stroller in town! 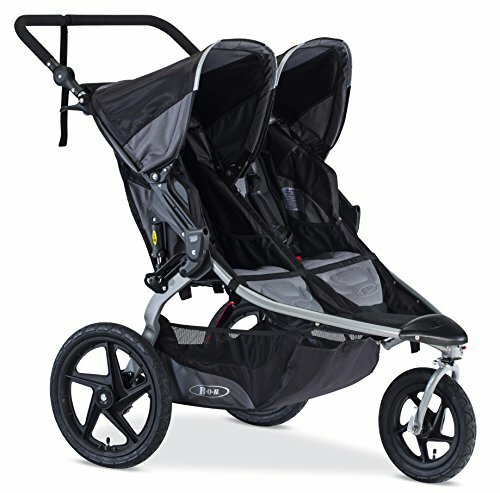 This Stroller is Useful for parents who want to start or continue with their jogging routine. Double jogging strollers are perfect for families who want to remain fit and continue with their exercise routine regardless of having two kids. This type of strollers provides the possibility to the parent to pursue the fitness regime with the kids in tow. It removes the hassle of trying to find someone to babysit the children while he or she is going out for a run or wait for her partner to come home before she can jog around the block. The use of this type of stroller also helps the parent to shoot two birds with one stone, as going out with the kids can be a welcome break and a breath of fresh air for both the children and the parents. The children also get to be exposed to the outdoors, while the parents get the chance to exercise. Comfort for kids and convenience for parents are the major two qualities of the BOB Revolution SE Duallie Stroller. It is an amazing double jogging stroller that provides optimum riding comfort for your kids and convenience for you as a parent because it’s not difficult to lug it around. 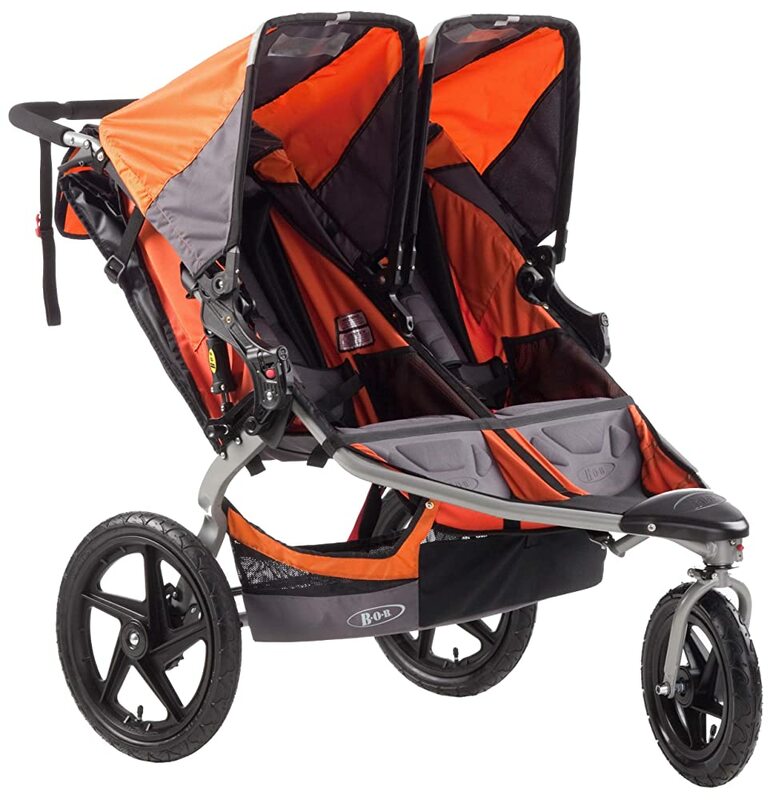 It may cost higher compared to other strollers, but the great suspension system which acts as a shock absorber, the stability, and the overall performance of the stroller will surely allow you to achieve your running goals with your kids in tow. It is very easy to maneuver, has safety mechanisms which will make you feel safe whatever jogging pace you are running, and it is very comfortable for the kids. More importantly, you can indeed multitask. While jogging, your kids will definitely enjoy their comfortable ride, thanks to the state-of-the-art suspension system. This jogging stroller provides a very light and stable run as it comes with a swiveling front wheel that can be locked into place for a quicker pace and can be unlocked for maximum maneuverability. The handle bars are also great and easier to grip and comes with a strap to ensure the kids’ safety during your jog. There are also large canopy windows so you can check on the children during your jog. It may be pricier than most jogging strollers in the market, but it is worth every penny. Double Umbrella Strollers are perfect for families who travel a lot. If you are the type of family which tends to travel a lot and you have two kids, both under the age of four, then you should get a double umbrella stroller. 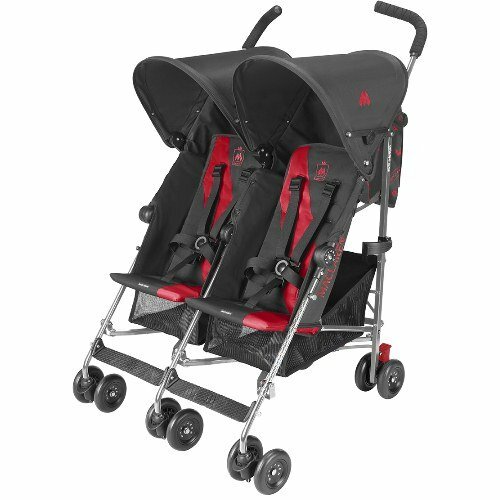 Double Umbrella Strollers are not just lightweight; they are super compact and easier to fold and set-up compared to the usual strollers. It is best for land travel since it is easier to get in and out of a vehicle trunk or compartment and it does not require too much space. It is also perfect for sea and air travel for the same reasons, plus easier to maneuver in air terminals and seaports. The stroller is ideal for families who routinely take public transportation such as trains, buses, and taxi cabs. Double umbrella strollers are also perfect for parents with smaller vehicles, and families with smaller homes like apartments, flats, or condominium units as it does not take too much storage space. The brand Maclaren is almost synonymous to umbrella strollers, and why not, the lightweight yet sturdy frames of Maclaren Twin Triumph Double Stroller has been sought after by most parents especially urban families and those who travel a lot. What is so great about the Maclaren Twin Triumph? Almost everything. It is lightweight; it comes with seat back pockets for storage, as well as average sized pockets under the seat baskets. The seats and the canopies can both be adjusted independently of each other. The handles are high enough to be comfortable to maneuver and grip. It is also loaded with safety features such as easy-to-engage brakes, safety nets for younger infants, and five-point harnesses which are padded and have three height position adjustments. It is basically a no-nonsense lightweight double umbrella stroller that you can just fold quickly and store at the back of your car! A plus points for apartment dwellers who are space-conscious because this one will not eat up much of your storage. More importantly, the lightweight frame makes it easy to maneuver, carry once folded and stored. It is very convenient to use and at the same time safe and sturdy. What can be a better stroller that the Graco DuoGlider Classic Connect Stroller? It provides a great seating comfort for both of your babies and a significant level of convenience for you. 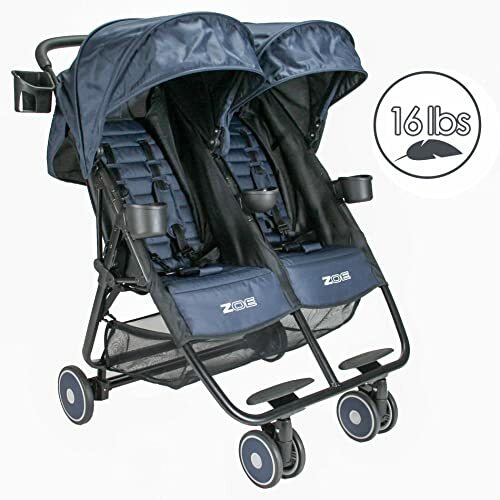 Both seats are roomy, can completely recline for infants to take a nap, the canopies provide excellent coverage, and the ride is smooth and stable. It can accommodate two infant car seats as well for your and your babies’ convenience. Once your babies are old enough to observe the world around them, both will have a great view, thanks to the stadium-style seating that provides an excellent vantage point for the toddler in the rear seat. Also, the storage is great because it is extra-large, plus it has a parent tray for your convenience. 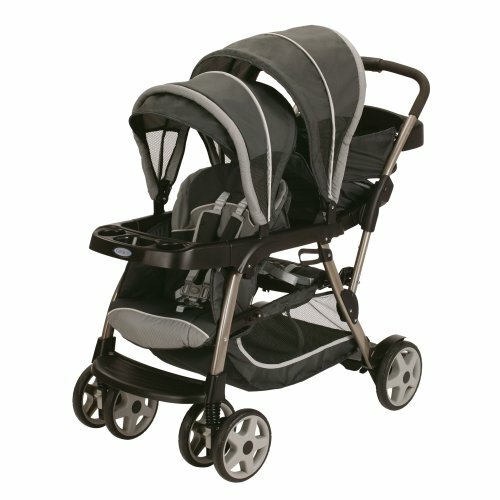 This type of stroller is very useful for families who live in urban areas and would need a more compact double stroller. Unlike their side-by-side counterparts, in line strollers usually are more compact and can be easily maneuvered through narrow doors and openings. This type of stroller is perfect for urban areas that may not have pedestrian lanes that are very broad or may have streets that are way too crowded. In line strollers are also ideal for families with children who have a one-to-two year age gap, as the older one will most likely enjoy the front seat, and the younger infant can take the back seat. Since infants may need to stay closer to the parent or the caregiver, the back seat will be perfect as it is more accessible. They are also likely to have a more peaceful slumber as there are fewer distractions in the back seat compared to the one in front. And since they sleep a lot more compared to their older sibling, they would not mind being at the back. 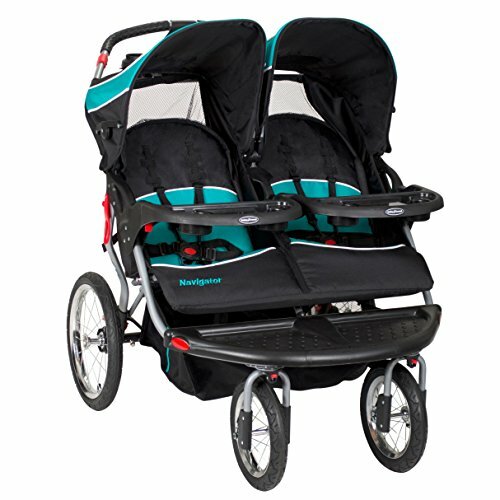 The Baby Jogger City Select Stroller with 2nd Seat is so far the best tandem double stroller on the market. It has the flexibility of just using it with one child and using it for your second when the time comes eventually. It is very compact for a double stroller. It comes with sixteen unique positions for double carriage, and can even function as a single stroller if you are not traveling with your second child. Both seats can fully recline at the same time, and both have great canopy coverage. More importantly, it has a lot of safety features which include a five-point harness, handle breaks, as well as manually-locking front wheels. The ride is smooth because of the exemplary suspension mechanism. It is easy to maneuver and is narrow enough to fit all doors. It folds up easily and folds flat so as not to occupy too much space in your vehicle. It also has a wide storage basket. Truly, it is the best time of inline stroller to buy, especially when you have that vision of a growing family. This stroller is very useful for families with two kids who have a three-year age gap. While toddlers may love to walk around whenever they are out of the home, these little critters still get tired easily and would sometimes need to be carried or pushed around in a stroller. Sit and Stand Double strollers are the best choice for this situation, as the younger one will definitely need to be in a stroller, and the older one can just hop in, stand or sit down as it pleases. At around three years old, children get bored so having a better view of the world around them would entertain them further whenever the family is out. The standing platform of this type of stroller allows the toddler to see the world around him. At the same time, he can also sit when he becomes too tired of walking on the floor or standing on the stroller platform. Meanwhile, everything remains breezy and relaxing for the infant as he remains comfortable in the front seat. 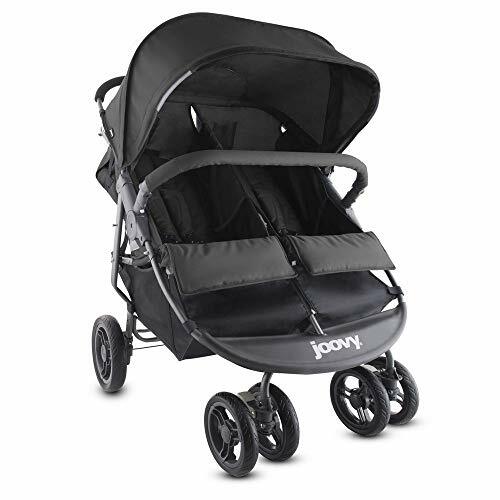 The Joovy Caboose Stand-On Tandem Stroller is by far the best sit and stand tandem stroller in the market. 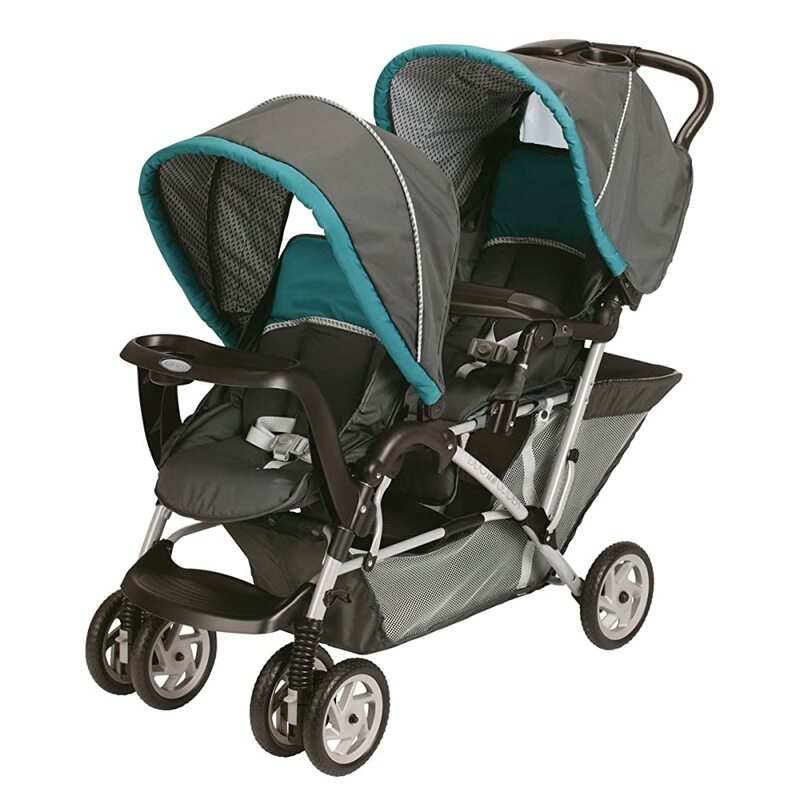 For a mid-price range, you get a very useful double stroller that is easy to use, and comfortable for the children. The stroller is so compact and lightweightthat it can be maneuvered easily, fit through doors, and fold super-flat when being transported. It is perfect and safe to use for strolling outdoors, as well when running errands in indoor establishments like supermarkets, malls, and shops. It is very convenient to use as it has a universal infant car seat adaptor. The toddler has the option to just stand-up, or to sit on the toddler bench, making him or she feel more independent. More importantly, the parent would not have to carry both kids into the stroller because the older one can just hop on. Adequate safety mechanisms are also in place to give you the peace of mind while strolling around your neighborhood or while doing your daily errands. The infant seat of the stroller can fully recline to allow your younger baby to nap comfortably. The toddler jump seat, on the other hand, is cushioned, has handles, and a foot rest. Your older child can also rest its back by leaning on the back of the infant stroller. All harnesses are padded, and the canopy for the infant is safe enough to protect your younger child from the sun rays or sudden changes in the weather. Double strollers designed for travel are perfect for families who regularly take trips within the city, out of town, and even out of the country. Strollers are definitely a huge lifesaver for parents whenever traveling. It does not only take the burden of having to lug around two children while carrying luggage; it helps children get rest while waiting for the boarding schedule, temporarily helps parents corral the children in heavily populated public places like airports, seaports, train and bus terminals, and at the same time act as extra push cart for lighter bags. Double strollers for travel also leave the parents worry-free as these type of strollers comply with the standards set forth by the Federal Aviation Administration and majority of the airlines around the world. Double strollers can also serve as a makeshift area for diaper changes, and even for snack time or feeding time if need be. If you prioritize a smooth ride for your children, and maximum convenience for you while travelling, then the Britax B Ready Double Stroller is the best double stroller for travel with your family. It comes with more than a dozen configurations, and can readily be converted into a double in line stroller anytime you would need one! It can also accommodate car seats without the need for additional adapters – so no more additional expense on your part. This double stroller promises a very smooth ride for your babies as instead of air, its tires are filled with foam that can absorb bumps and uneven road surfaces while you are strolling about. The seats, harnesses, as well as head rests are adequately padded for your baby’s comfort, and the canopy is large enough to ensure maximum coverage in the event there is a change in weather or your kids may need more protection from the sun’s rays. More importantly it has higher handle bars that are easy to maneuver – even with one hand. It also has a one-step brake system that can be engaged easily. More importantly, it also folds up real quick, with both seats in place so you need not worry when you need to use it again. Another advantage of choosing this stroller is that it also has a great storage provision, thanks to its over-sized under-seat basket that can be accessed from any side of the stroller. There is also a parent cup holder that cis very convenient and helpful especially for long walks. You can never go wrong with this double stroller. B00GJIXP5O: This item is not accessible through the Product Advertising API. Compact Double Strollers are very useful for families who are space-conscious. When a family lives in a smaller home, or owns a smaller type of vehicle with a relatively smaller trunk capacity, compact double strollers are the strollers that they should be considering to buy. Compact double strollers do the job of a regular double stroller without wasting space. These strollers can be easily stored in a small cabinet in an apartment of condominium dwelling, or in the trunk of a sub-compact sedan. This type of double stroller is also very useful for families living in cosmopolitan cities, and who stroll around the metropolis either for errands or leisure. Highly urbanized areas are usually crowded, and double compact strollers make it easier for parents to maneuver their children’s stroller among the busy crowd, or narrower public doorways. It is also great for travelling especially by land, as it will not take too much space in the vehicle trunk. Could be one of the lightest double strollers in the market at just 18 lbs., making it easy for you to travel by air. It has a super compact fold making it easy to ferry in and out from the car, or unto your home storage. 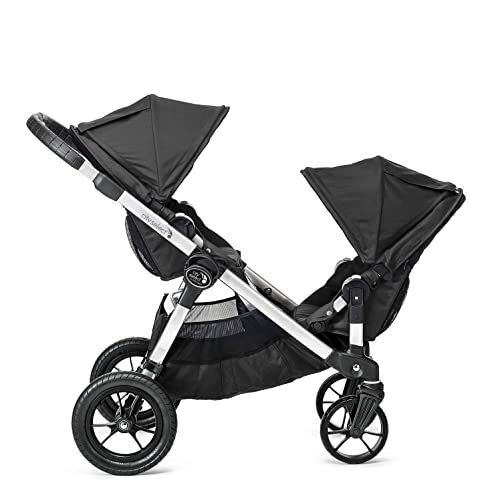 This is the perfect stroller for families living in urban areas, because Delta Children LX Side by Side Stroller, Night Sky is sleek, and easy to use even on public transportation because it is easy to fold. Comfort also does not take a back seat in this side-by-side stroller, as it has soft padded seats and harnesses that ensures your little ones are seated comfortably. It has multiple recline positions as well for when the babies need to nap. It is super easy to maneuver too because the front wheels can swivel in 360-degrees and has a shock absorbing mechanism to ensure a fuss-free smooth ride. It has large European style canopies that can be adjusted independently from each other, so whatever the height of your babies are you can be sure both will be adequately covered when the need arises. As for storage options, it comes with two storage bags that can house your babies’ needs plus a parent cup holder to boot. Its great fabric is easy to clean too! Double strollers for twins are very helpful in terms of allowing the parent to juggle through the needs of both her babies when the family is out of the home. Double stroller for twins is usually the type of stroller that allows the parents of twins to go about their routines in spite of having two same-aged children who may have different demands and needs. Holding two babies at the same time when outside the house can be very tiring and stressful and having a reliable stroller can be considered a saving grace. It also allows booth children to do what they need to do like take naps, explore, or play around without having to bug the other one or hampering his or her parent’s routines and errands. Moreover, when they get older, the stroller can provide them the same eye level and view so that they will not have to argue about who would have to seat in front, and who gets the backseat. Hardworking and Easy to use. These are the best adjectives to describe the Baby Trend Sit and Stand Double Carbon. It is an in line stroller that can accommodate two infant car seats of various brands should you have twin babies. It can also be ideal for a toddler and a newborn as the rear seat can be converted into a jump seat or a sit-and-stand stroller. The younger baby can comfortably sit and recline up front, while the rear seat can be reclined as well for when the other baby needs to take a nap. When the other child becomes old enough to be very curious about his or her surroundings, then the rear seat can be converted into a jump seat that will in turn convert it into a sit-and-stand stroller. Apart from the efficiency, the stroller guarantees comfort for the young ones as the padded seats, and great canopy coverage, and reclining seats provide them with a relaxing ride as their parents go about the stroll or the errand. It also has adequate safety mechanisms, such as foot-activated rear brake and a five point harness system for both seats. These safety features will surely provide peace of mind for the parents. Storage will also not be a problem as it has an under seat storage basket, as well as cup holders for both the kids and the parents. It also has a covered console near the handle bars which can be used as the parent’s storage for keys and a mobile phone. More importantly, this is easy to use as it is light and easy to maneuver but stable enough to avoid toppling over. It has a quick one-hand fold mechanism and can stand on its own when folded making it all the more attractive to parents. 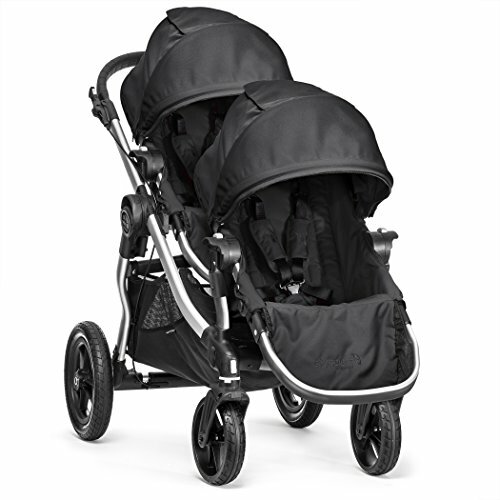 What to look for in a best double stroller ? 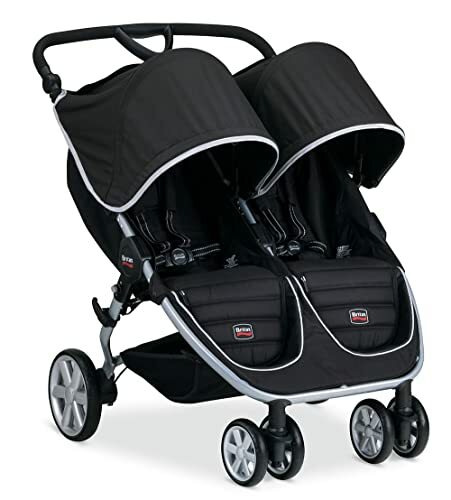 There are inline double strollers, which has one seat in front and the other at the back making it look like a “mini-train.” These are more compact in terms of going through narrow doors, however there should be enough space between the strollers so that both kids could be comfortable. A theatre-like seating where the one at the back seat could be slightly elevated can give the kid at the back a better view of the road ahead. Also, some inline strollers do not give the same degree of seat recline. Then there is also a side-by-side stroller which gives both kids the same view while strolling and most of the time same degree of recline too, so that they could both nap comfortably at the same time. The problem here is that if it is too wide, you may have problems in maneuvering the stroller or going through narrow doors. Then there are sit and stand strollers, where the an older child could be seating or standing in a jump seat, while a younger one can be napping or seating in the front seat. The caveat here is when the older one suddenly becomes too tired and sleepy, there is nowhere in the jump seat where he or she could nap comfortably. Equally confusing is when you do your research, as you may encounter conflicting reviews on the products that you are eyeing. And with the many factors to consider in buying a double stroller, you can only do so much balancing and discerning before finally deciding which one to buy. A good question to ask when buying a double stroller is how comfortable would the kids be while riding on it. At the very least they should be cushioned on the impact of the stroller on the road surface so that they will not be bothered while riding about whether they are napping or not. The buyer should take a closer look at the suspension system and if the shock absorbers are good enough to give the children a smooth ride which will not rouse them from their naps despite the changes on the strolling pace or the road surface. Another factor that should be closely checked is how do the two seats operate? The buyer should note if the seats are independent of each other’s movement in terms of reclining and canopy angling. This is because even if you are carrying twins, kids do not nap at the same time, be awake at the same time, or even like to do the same things at the same time. And if by chance the other kid is older, and taller, obviously the canopy settings and angling should be independent of each other to ensure the comfort of both children. Whether you are eyeing the most basic, or the high end double stroller, one factor you should never scrimp on is the safety level afforded by the double stroller. The parent should closely examine the type of harness used, the brake system of the whole stroller, and if there are additional features such as a parent strap that will ensure that the stroller will not go out of control in case the parent may have accidentally let go of the handle bar while strolling. More importantly, check if the stroller has passed government safety requirements and testing, and that if there is an ongoing recall on the brand and particular model of the stroller that you are eyeing. 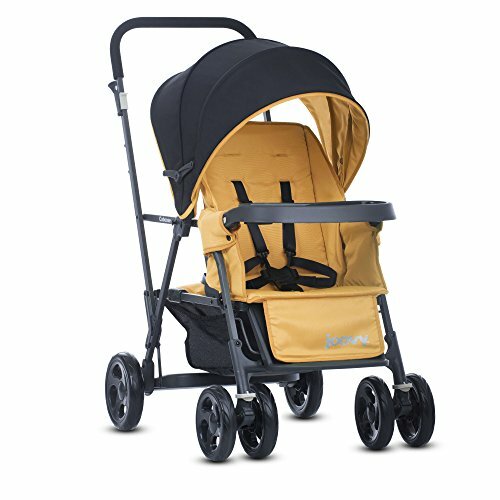 When trying to decide which double jogging stroller you should buy, always think about the unique features it has over the other similar types of strollers which are being sold on the market. Ask yourself if these functions are important to you and if this would make your children’s ride even more safe and comfortable. You may also want to ask yourself if the added feature makes the stroller easier to use on your part. You should have at least two other strollers of the same type to compare. You cannot just compare it with one of the similar models on the market because you might be missing a crucial feature that will make your jogging, and the kids’ ride a much more pleasant experience. At the end of the day, you will be concerned about the cost of the double jogging stroller no matter how much budget you have allotted for the purchase. You may want to ask yourself if all the features of the double jogging stroller you are closely observing worth it. If you would like a double jogging stroller, then you may want to check out the jogging experience and safety considerations. Are the handlebars high and comfortable enough for you to grip while running? Check if the tires can withstand a faster jogging pace and rough and uneven terrain as well. Also, pay attention to the front wheels – ideally, they should be able to swivel in order to change directions swiftly when needed. Check how to engage the breaks as well. Examine the type of harness installed in the stroller and is it easy to fasten or buckle-up. Consider is the harnesses padded and thereby comfortable enough to be worn by the babies. You may also want to note how easy it will be to clean the harnesses as a mess, drips, and even throw ups occur anytime. Check if a drool pad can be attached to it. You may also want to see how the harnesses can be adjusted as the baby grows. All these inquiries are necessary to ensure the safety and comfort of your child. 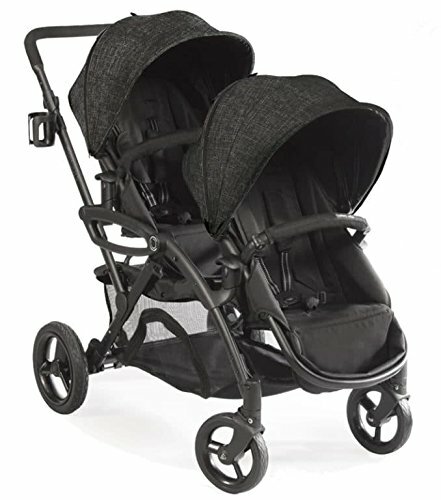 Ask the salesperson about the type of breaks which are installed in the double stroller. Are those manual breaks, or hand breaks? Test and ask if the breaks are easy to apply as well or you will have to bend forward and exert a lot of effort before it could lock in. You may also want to check how much weight can it hold and will it slide down a slope while the brakes are engaged. Some double strollers (especially those for jogging) come with a safety strap to ensure that the stroller will not get out of hand once the parent or caregiver starts to jog or run. This additional security feature is imperative if you like to run on uneven or down-sloping roads. Examine where the stroller is manufactured and assembled. Check if the used materials are sturdy and durable enough to withstand daily use. You may want to test the stability of the double stroller base as well; test if it can tip over easily. Do check if the locking mechanism for the sitting and folded-up position engage well enough not to cause accidents. Consider carefully how easy could the double stroller be locked into place, and how much effort you would have to exert to lock up the moving mechanisms. 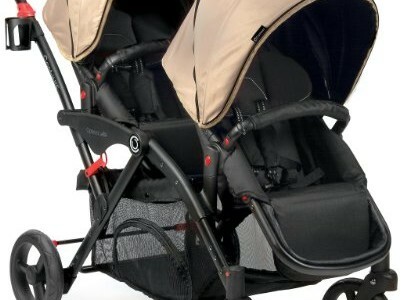 How durable are the materials used in the manufacturing of the double stroller ? Check if it is made of light metal or hard plastic and if it will break if you accidentally drop the stroller. You might want to examine the fabric surfaces as well. Know if it is durable enough to carry the weight of your babies. Take into consideration if it’s easy to clean and if it had passed flammability tests. You may want to know as well if the fabric fades and pills over time. Check the material by touching it. Is the fabric material used on the seats breathable enough? Double check if the double stroller had passed standard government and private sector quality and standard tests. Demand proof of this as well. It will also be helpful to note where the stroller was manufactured and assembled. Check if the double stroller can recline independently, and how easy will it be for the parent or caregiver to recline the seat for the any of the children. Check as well if it can fully recline to accommodate a sleeping baby or a napping toddler? Examine the suspension system of the stroller particularly if it comes with a good mechanism. There should be a great set of shock absorbers that will cushion the babies when you are jogging or strolling on uneven surfaces and slightly rough roads and terrain. Check as well if the shock absorbers are creaky or silent. Type of fabric used in the seats. Feel with your hand if the fabric used in the seats of the double stroller is good enough to keep your baby or babies cool in the summer, and warm enough during the winter. Ask the sales personnel about the cleaning or washing instructions. Examine how soft the fabric surfaces are, especially the ones on the seats. Ask yourself if the seats are padded enough to cushion your children in comfort. Just like the seats the harnesses will be directly touching your little one’s body. Their trunk, their arms, their face, even their neck! It would be more comfortable for them if the harnesses are padded, or at the very least, not rough and hard on the touch. Check if the canopy fully protects your child from the harsh sun rays or the cold of the winter, or sudden rains when you are outdoors. Count of how many panels is it composed and see if there is a top window where you could quietly peek to check on the babies without disturbing them. Ask as well if the canopies are removable, waterproof, and how easy they are to clean. You may want to check if the double stroller comes with a foot rest for toddlers and older children. If possible, test with your older child if it could provide support. Otherwise, your child will choose to dangle his feet instead of using it because it is too uncomfortable. Compare the measurement of the space provided in each seat with space measurement of double stroller you are eyeing to buy. Ask yourself or imagine if bigger or taller babies and toddlers could fit in, and if two kids would be able to stretch their feet and sit (or lay) comfortably? Check how heavy the stroller is and compare its weight to the weight of similar type of strollers on the market. A lightweight double stroller maybe a good choice but it may not be sturdy enough. You may want to inspect if the stroller comes with a snack and beverage tray for both babies and the parent. Inspect as well if space is wide enough to fit a meal, and if the cup holders are wide and deep enough to stably hold a sippy cup or a water bottle (or even a coffee tumbler for you). If it does not come with one, ask where you can buy it. It is important that you have this option especially if you are planning to use the double stroller with a car seat. Ask the salesperson if it can be attached to the car seat. Otherwise, you will have to move your infants back to a stroller once you get to your destination. If it can accommodate car seats, ask what types, brands, and models of the car seat can it provide with and do they have a travel system set that already fit your needs. Check if the double stroller comes with storage compartments, and if yes how big are the compartments. You may want to take note if the basket remains accessible in case the stroller is fully reclined. Also, check if the storage basket is easy to clean in case there are spills. Pay attention to the other storage options the double stroller may offer. Does it come with a parent console or with a back pocket that could keep keys, some change, and hold a mobile phone? Take note as well if it comes with a bag hook. All these are important because when you are out and about, you will need a lot of storage as you cannot be holding your diaper bag plus shopping bags while pushing the stroller. Check if it can collapse easily for loading in a car trunk. Know how many steps will it take to collapse or fold the double stroller entirely. Try for yourself if it is hard to collapse or easy enough to be folded using just one hand. While you are at it, check if it can stand on its own while it is folded. You may also want to know if it automatically locks when folded up. All these factors are very important as you will be doing a lot of collapsing and setting-up whenever you use the stroller, especially when you are going elsewhere. You may want to check how bulky the double stroller is. You may want to ask for a demo or actual observance of the double stroller while it is in a folding position. This is so that you will know how much space it will occupy in your vehicle and your storage area at home. Ask if it can fit a small car or can only fit an SUV? You may want to consider the space it will leave in your car once it is already in the trunk. Take note if you will be able to carry grocery bags and other stuff while it is there. Take into consideration how easy is it to clean. Ask if it is completely washable or it can only be spot cleaned. Ask if the fabric materials can be machine-washed and if yes, how fast will it take to dry. Give your attention to the tires as well. Check if the tires come off and can be placed back easily. Know if you’ll have to pump air into it every now and then. Analyze if it is a cheap double stroller, a mid-range, or a luxury double stroller. Evaluate as well if it really fits your budget or if it is a long stretch. 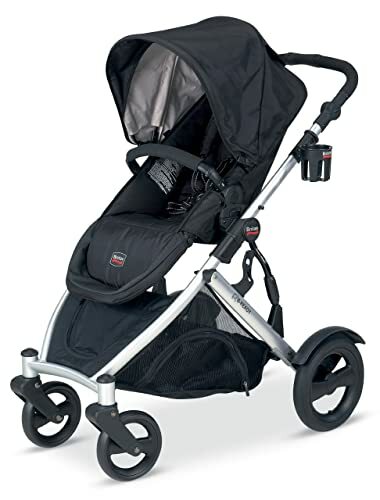 It will also help to compare how it fares vis-a-vis other strollers in the market, price-wise. Ask yourself as well if the re-sale value important to you. Check too if it comes with a warranty and what are the terms, if any. Take into consideration as well if it is a well-established brand in the market that has been known for making the best double stroller. Where do you buy it? Is it available online or is it just available in physical stores? If online, does it ship for free? How many days will it take? If it will be bought in a brick and mortar store how narrow is the box and can you easily assemble it? Can you ask for assistance to do so? Are the clerks, or online sales representatives patient enough to answer your inquiries? Are they quick, and well-informed? Has the manufacturer provided enough answers to FAQs and are the sales representatives willing to answer more and fully-explain points you would like to clarify? How is the after-sales service of the store? Do they value customer needs and respond to them? Do they accept feedback? What colors can you choose from? Are all these available in your store of choice? Are there other designs and prints to choose from? Does it come with unisex designs? How about girly or boy prints? Does it come with separate accessories that can be purchased? Where can these be purchased? As you can see there are many questions that you have to ask, as well as features that you have to examine before deciding on what stroller to purchase. More importantly, you may want to read about the feedbacks and reviews o the stroller, so at least you could get a grasp on how it functions, and if it functions well. It would also help to watch online videos for reviews, unboxing, as well as instruction guides on the stroller that you are eyeing to buy.